We grew up in a busy household. With four kids, all of whom were involved in sports, music lessons, clubs, etc., and two full-time working parents, you can imagine things got a little hectic once in a while! But our mom was a real champ, and always made sure we had a healthy, home-cooked dinner on the table for us. You can probably all understand, though, that by the end of the week she was pretty tired of thinking up of something for dinner. So she started a tradition that made Friday night pizza night! Obviously this idea was not met with any resistance from us kids, because lets be real- who doesn’t love pizza? 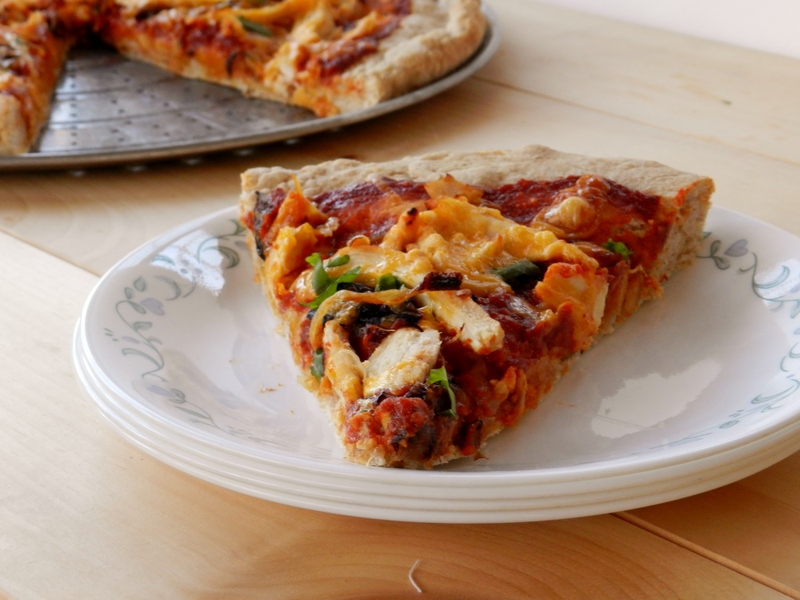 Of course, the pizza we had on these nights were of the store-bought variety since making pizza from scratch would kind of defeat the whole purpose of not having to cook that night, but that didn’t bother us one bit. Heck, if our mom wanted us to eat pizza every Friday night we sure weren’t going to complain about it! We consider ourselves pretty lucky because our family isn’t stuck on classic pepperoni and cheese- they like to get a little more adventurous with their pizza, which is much more fun for us! So for our pizza night, we made not one, but two pizzas! 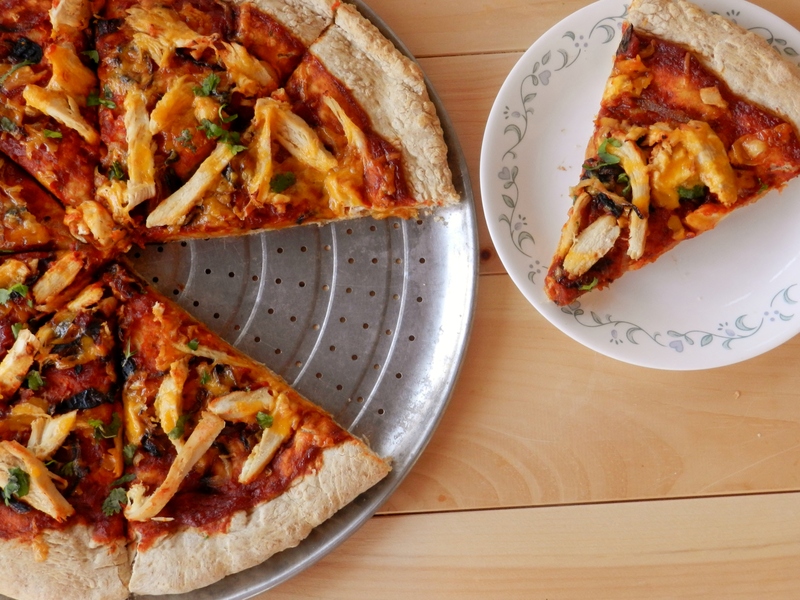 For the first of these two pizzas, we capitalized on our family’s love of Thai food, and made a Chicken Satay Pizza. When we told our brothers what it was, they shrugged and said “We don’t know what ‘satay’ means, but it tastes like Thai food on a pizza!”. Well said, bros, well said. Preheat the oven to 350F. Spray a large pizza pan with non-stick cooking spray. 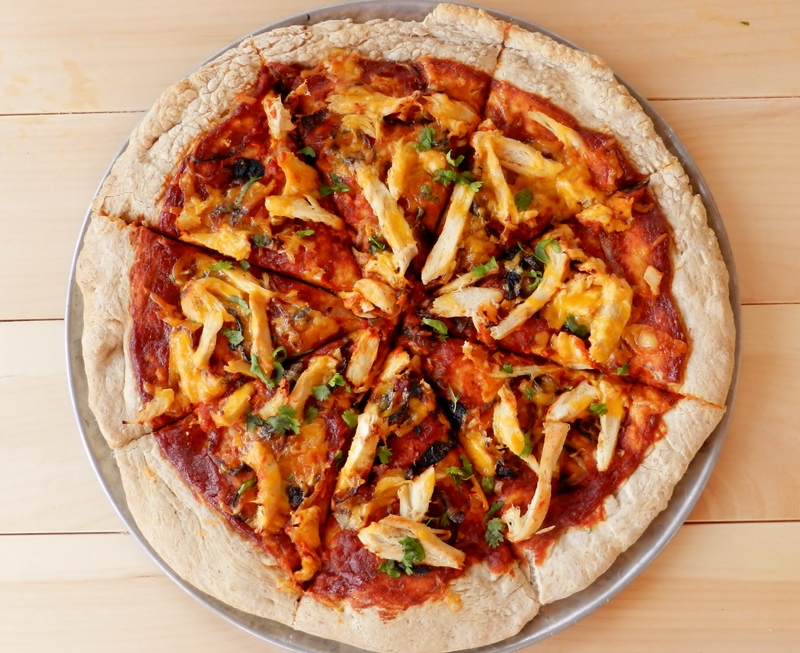 Roll out the pizza dough until it fits the size of the pan. Brush with olive oil. In a bowl, combine the peanut butter, soy sauce, lime juice and siracha. Stir until smooth. Slowly add the water, stirring until the sauce becomes smooth and drippy. Spoon about 2-3 tbsp of the sauce onto the pizza crust. 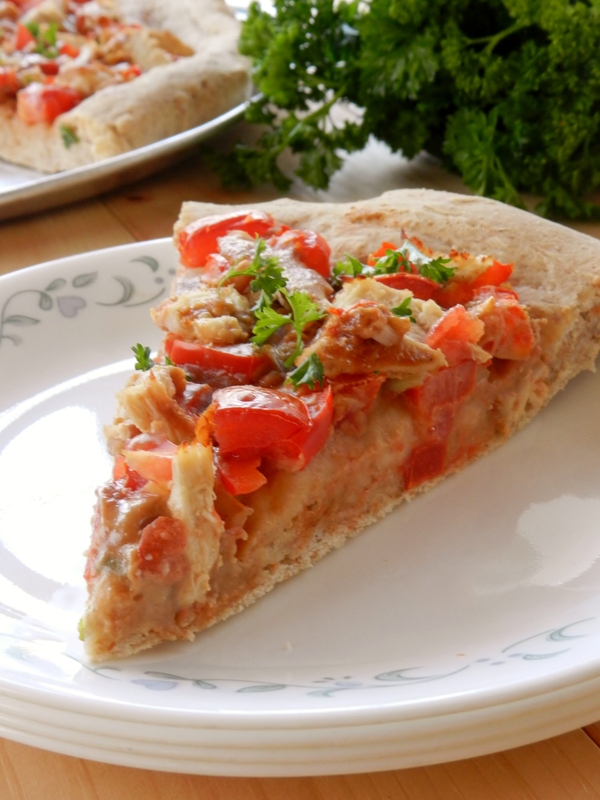 Top with chicken and vegetables. 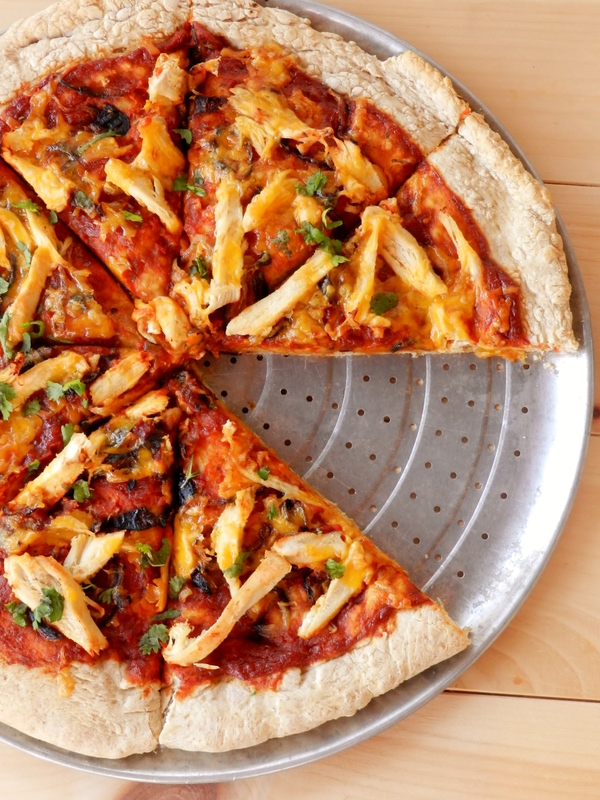 Bake the pizza for 15 minutes, remove from the oven and drizzle with remaining sauce. Return to the oven and continue baking for another 10-15 minutes, until the crust is lightly browned and the bottom of the pizza is firm. Top with parsley. *You can use whatever peanut butter you have on hand, however it might change the consistency of the sauce a bit, and your sauce will probably taste a little sweeter. 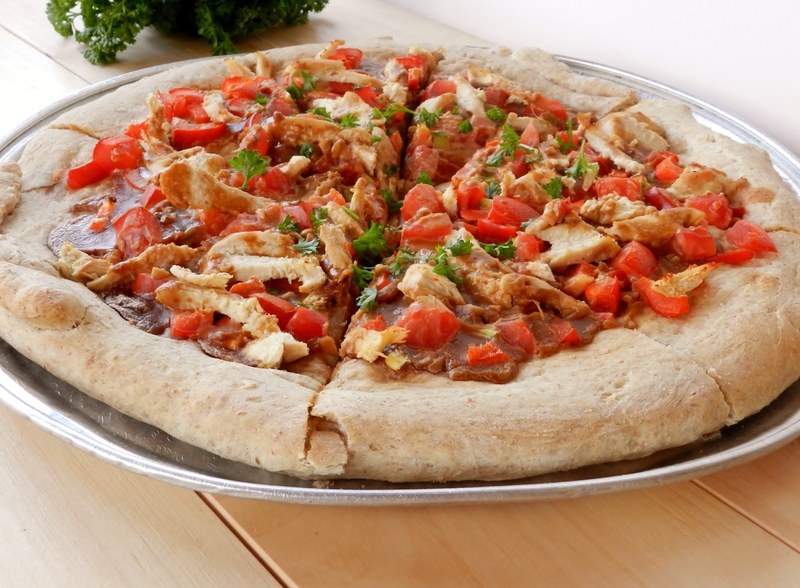 And now on to pizza #2: Caramelized Onion BBQ Chicken Pizza! 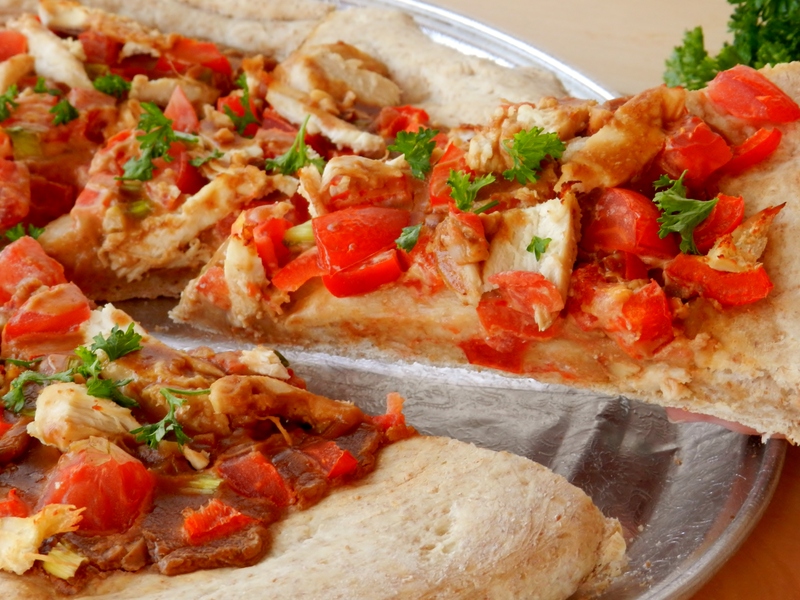 We really can’t say enough about this pizza! 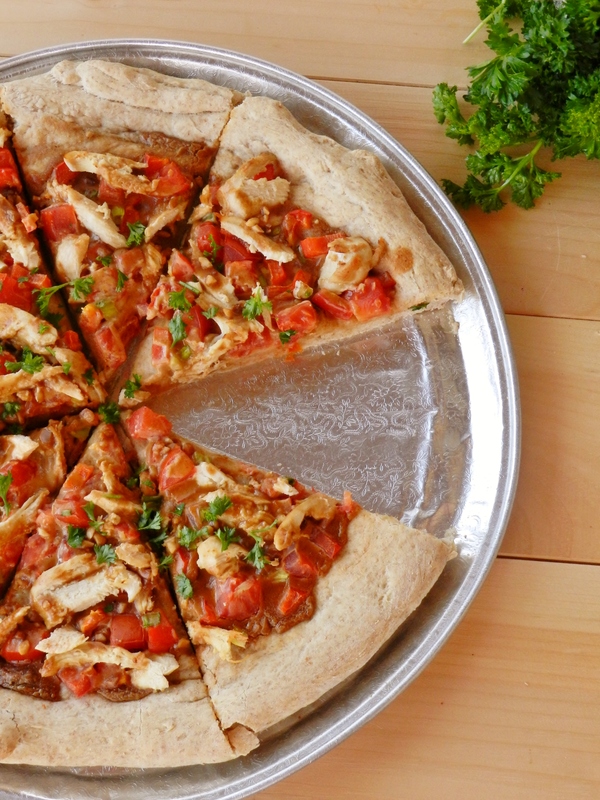 It is a little more work than the satay pizza, but oh man it is 100% worth the effort! Heat 1.5 tbsp olive oil in a medium-sized pan over medium heat. Slice the onion into thin strips and add to the pan. Cook, stirring frequently, for about 20-25 minutes, until the onions are browned. Remove from heat and set aside. While the onions are caramelizing, prepare your sauce. Add all sauce ingredients (pineapple, tomato paste, etc.) to a blender or food processor and blend until smooth. Taste and adjust seasonings to your preference. Preheat the oven to 350F. Spray a large pizza pan with non-stick cooking spray. Roll the dough into a large circle to fit the pan. Brush with a little olive oil. 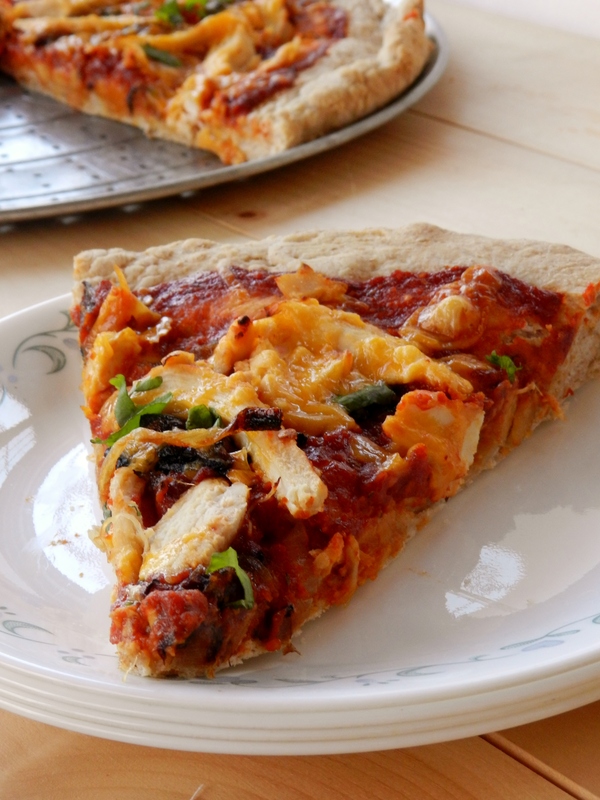 Spread the sauce over the pizza, top with chicken, caramelized onions and cheese. Bake for 25-30 minutes, or until the crust is lightly browned and is firm on the bottom. Top with cilantro. As you can see, we didn’t include a recipe for pizza dough. 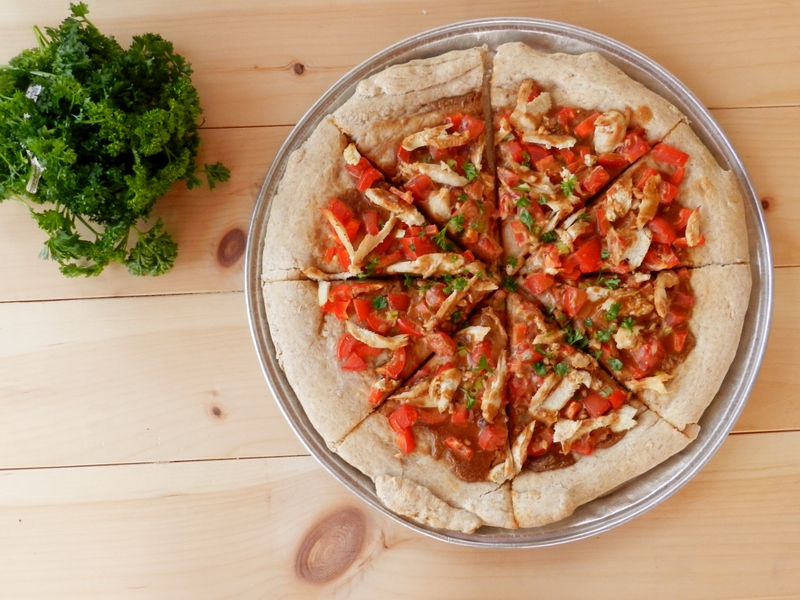 Truth is, we did in fact make our own dough, but it didn’t turn out exactly the way we wanted it to, so you’ll have to wait for the perfect whole wheat pizza crust 😉 For now, feast on pizza made with store-bought dough! It’s all about the toppings anyways, right? So the question is… creamy, peanut-lime taste-of-Thailand? Or sweet-and smokey back yard barbecue? Posted in Uncategorized and tagged barbecue, barbecue chicken, barbecue chicken pizza, barbecue pizza, barbecue sauce, caramelized onion pizza, caramelized onions, cheese pizza, Chicken Pizza, chicken satay, dairy free, dairy-free pizza, dinner, food, healthy, healthy pizza, low sodium, low sodium barbecue sauce, night pizza, parsley, peanut butter, Peanut butter pizza, peanut sauce, pineapple, pineapple barbecue sauce, pizza, pizza night, pizza party, recipe, Satay Chicken, Satay Chicken Pizza, sports music, sugar-free barbecue sauce, sweet and smokey, thai, Thai food, Thai Pizza, tomato paste, whole wheat, whole wheat pizza, working parents. Bookmark the permalink. Yum ladies this looks delicious! 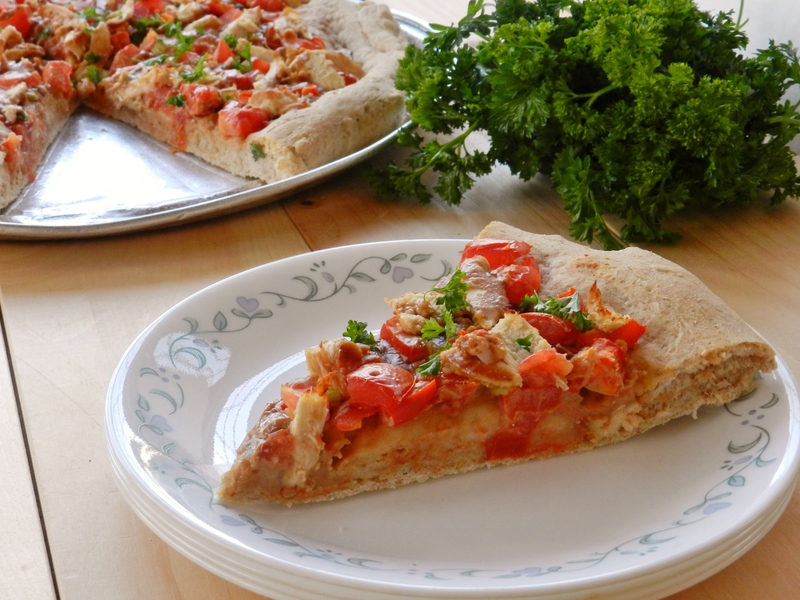 I’ve got to start looking for wheat free alternatives as otherwise I’ll miss pizza too much!